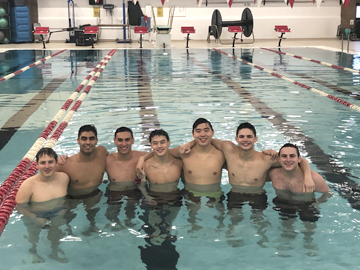 Seven of the team’s eight seniors, many of whom have grown up swimming together. 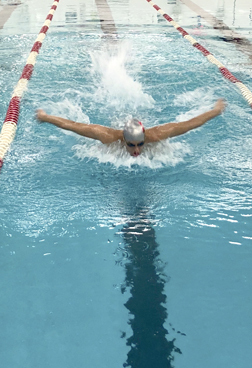 The Half Hollow Hills boys varsity swim team has a winning record that spans years. The team is hoping to continue the streak. Hills swimmers are undefeated for the past 11 years and are currently at 7-0. The boys won their most recent meet over Connetquot, 101-80. Head coach, Nina Cunningham hopes to continue the team’s streak as County Champions since 2007. “We have two more meets left this season and my anticipation is we will continue our undefeated streak,” Cunningham said. She credits her team’s success to the camaraderie among the swimmers and the fact that many make a year-long commitment to practicing. Although the team lost some top athletes to graduation from last year’s squad, Cunningham feels they picked up plenty of young talent. Swimmer Kabir Randhawa puts power into his butterfly stroke. One of the reasons Hills swimmers are dominate is that many of its members practicing with club teams. Offseason work is crucial for swimmers to maintain and improve their race pace, she said. Four of her swimmers have qualified for the state championship meet, including the team’s three captains: Senior captain Kabir Randhawa has been a state finalist for the past three years and is favored to win the 500-yards freestyle; Corey Sherman, a senior captain, qualified for the states in the medley relay; and senior captain Matt Park, a News 12 Scholar Athlete scholarship winner, will also go to States for the 500 freestyle. Sophomore Ben Glazebnik will join them at the state meet in the 50 freestyle race. In preparation for the meet, each swimmer will have individualized and specialized practices. For the captains, it’s important to set a good example, while staying engaged with their fellow teammates. 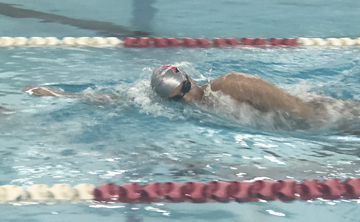 Practice, practice, practice – all year ’round–keeps Half Hollow Hills swim team heading to the state championships, says coach Nina Cunningham. “As captains, we do our best to motivate them and build team bonds,” Randhawa said. All of the captains have been on the team since 8th or 9th grade, growing up and learning the team’s values. The team is composed of swimmers of all skill levels, from swimmers working to perfect their flip turn to state finalists. Cunningham finds unity amongst her team when they collaborate to help one another out. These methods focus the athletes because they are either responsible in aiding their fellow teammate or are learning and working on their skills. Although, the State Championship does not give out a title, Half Hollow Hills scored the highest amount of points twice in the last three years and hope to do so once again. Their end goal remains the same to win County Championships another year.